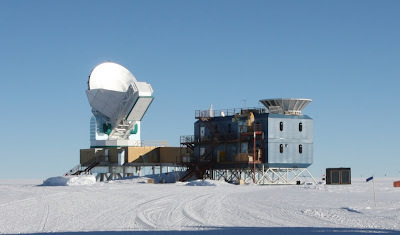 It's always fairly cold at the south pole - the all time high is -15C, set in 1958. Still, the speed with which the temperature can drop in late summer can catch you off guard. Two weeks ago, it was a balmy -30C, today it hit -46C. For the past 8 days, we've been setting record lows for this time of year. Cold snaps happen during calm weather here. If there's weather of any sort, it's likely to bring warm air with it. Wind, fog or clouds all mean warmer weather's coming. We haven't had any of that - it's been clear and calm for weeks now, and without injections of warmth, the temperature plummets about a degree C per day, just radiating off into space. Below about -42C, the air takes on a different feel. It's not just a colder version of -30C air, it's distinctly different. It gets a strange sort of sharp stickiness to it which is fairly hard to describe. Thankfully, the ECW gear handles these temperatures easily. Unfortunately, machinery doesn't. The planes bringing people and supplies in leave their engines on while on the runway, or else risk freezing up. 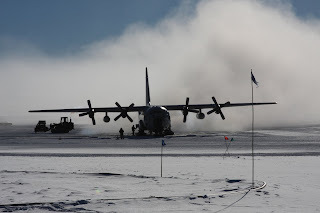 As the temperature drops, larger and larger clouds of condensing water vapor form behind the planes, making operations behind them (such as loading and unloading cargo) impossible. Contrails sit on the horizon for hours on end, and generally make a mess of the place. Below -50C, the planes don't fly, which can lead to an early station closing. We've got a week before scheduled closing, and only 4 degrees left - rumors have begun to circulate. 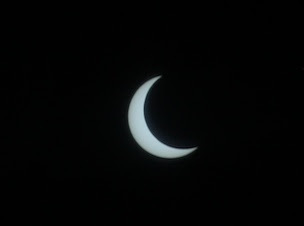 Yesterday, we had an 85% solar eclipse. It was quite a spectacle, to finally see the light outside dim, after living a month in perpetual sunlight. The station was quite abuzz with people running around snapping photos and starting out the windows. Start to finish, it lasted about 1+1/2 hours, during which time the temperature dropped another 2 degrees C. At that rate, station close could come at any moment. While I'm on the subject of the cold, there's one more aspect of life here I want to mention. Out at DSL, where I work all day with the rest of the SPT team, there are no toilets. It's a kilometer walk through the -60C windchill to get back to the station, but we have an alternative. A small black box on skis sits just to the side of the building, and serves as an outdoor port-a-potty. It has no plumbing, no insulation, and no electric, steam or gas heating. Through the summer, it's heated by the sun, and most of the time somehow manages to stay above freezing. Now that the sun's a little lower, the solar heating doesn't work so well, and it's starting to get pretty frigid in there. In winter, you make damn sure you hit the washroom on your way out of the station every day.